Even though stairs may be an afterthought for some, stairs can be one of the most architecturally interesting parts of your home. The repetitive, geometrical lines of stairs have the potential to define the look and feel of your home. Think of a classically beautiful spiral staircase or an industrial stainless steel one—they immediately invoke style and taste. “Today the trend is obvious, people want modern stairs to match their modern homes, so by far the most desired look is minimal—less is definitely more,” said Luke Marsalek, sales representative for Urban Stairs in Ottawa. He says where once there were circles, there are now squares, where there used to be ornately decorated spindles, there is now simplicity, what was closed is now open, and, increasingly, where once there was carpet there is now a hard floor. For the homeowner looking to incorporate modern elements, he recommends dark colours and interesting materials like glass or stainless steel. However, for those looking to buck the trends and go for something more expressive, the options are almost limitless. Trees really were, along with hills and stones, the original stairs. Why not go back to basics and try using a smoothed out branch as a banister? Or if you want to push it even further, here is a unique design, where it looks like a tree is growing. To incorporate organization, practicality and interesting design into your stairs, consider building storage space directly into your staircase. Here is a sleek example that pushes the modern lines and efficiency crucial for a modern look one step further. These stairs are great example of bringing some playful surrealism into the lines. These lines play with your eyes to create an effect that makes it seem like they are melting like a Dali clock. A fantastic use of imagination and although I can’t say for sure, they don’t look recommendable for those with vertigo. Book worms rejoice! Here is an amazing design by British designers that incorporate book shelves directly into stair cases. If your library is overflowing or you are looking for a unique way to show off your most prized possessions, this is a great choice for you. Stairs can also be used as perfect little chairs, so they could also be a lovely place for reading. When you are a kid stairs can be the most entertaining place in your house. Even most adults see a spiral staircase and can’t resist thinking of sliding down the banister. 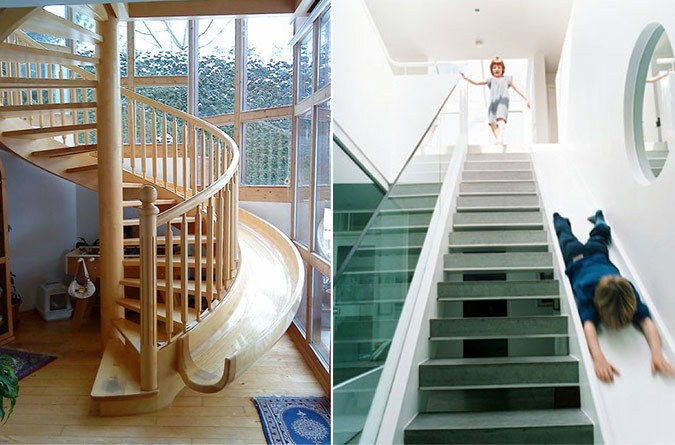 These staircases, in spiral and straight form, actually come with a slide beside it. It would make transporting items from upstairs to downstairs super-cool and would be a massive hit for children and playful adults. While most stairs are part of a larger structure, floating stairs are built directly into the wall. These are appealing for the ultra-sophisticated trendsetter. Designs can range from very minimal to more elaborate but all of these designs are eye-catching and unique. I know most readers here probably don’t have a moat of their own, but one can always dream. This is a beautiful example of working with nature and history to create a strikingly modern piece of work. If you are thinking of investing in a fortress, keep this design in mind.